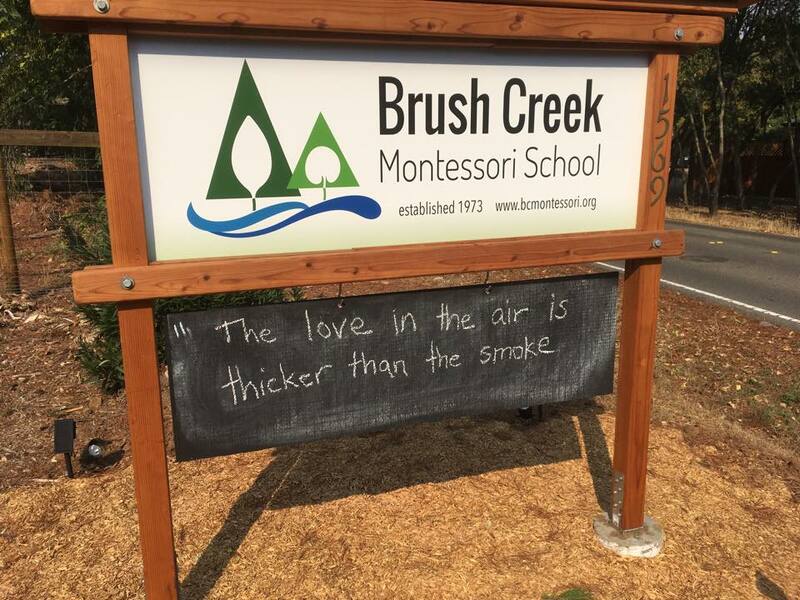 Help Brush Creek and the North Bay recover from the fires. So many of you have checked in on our school's safety. Thank you for your communication and concern! The school still stands, though it has sustained some fire damage and sits just outside a devastated zone. In addition, teachers, families, classmates, co-workers, and our larger community have been challenged through this great loss. If you can help, we would greatly appreciate your support here, now. • Donate to a local relief fund. A local credit union, a State Senator, and corporate supporters have created this fund - 100% of donations will go to those in need here in our area. The website is: https://www.redwoodcu.org/northbayfirerelief. • Give to us directly. As a 501c3 non-profit private school, we rely on tuition and tax deductible donations to support us. Several members of our community have been directly impacted, we have clear cleanup costs in front of us, and the possible changes in our student population and staff will be difficult for us to navigate. Any donations made right here, small or large, are deeply appreciated, and will help our beloved school community recover, open its doors again, and offset the impacts for staff and school families who have lost their homes. Our tax ID# is 68-0408407. Finally, you can help by sharing this page on your Facebook or other social media pages. We need to get the word out! Thank you again for your support for our Montessori community here in the heart of Santa Rosa! Sending hope and healing to all of you.